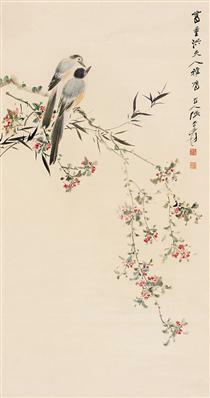 Zhang Daqian or Chang Dai-chien (Chinese: 張大千; pinyin: Zhāng Dàqiān; 10 May 1899 – 2 April 1983) was one of the best-known and most prodigious Chinese artists of the twentieth century. 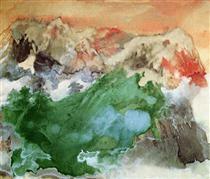 Originally known as a guohua (traditionalist) painter, by the 1960s he was also renowned as a modern impressionist and expressionist painter. In addition, he is regarded as one of the most gifted master forgers of the twentieth century. 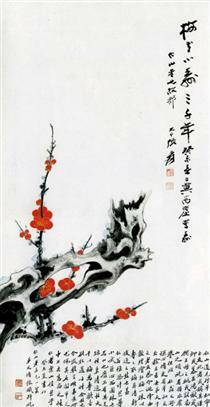 Chang was born in 1899 in Sichuan Province to a financially struggling but artistic family. His first commission came at age 12, when a traveling fortune-teller requested he paint her a new set of divining cards. At age 17 he was captured by bandits while returning home from boarding school in Chongqing. When the bandit chief ordered him to write a letter home demanding a ransom, he was so impressed by the boy's brushmanship that he made the boy his personal secretary. During the more than three months that he was held captive, he read books of poetry which the bandits had looted from raided homes. As a young adult Chang moved to Kyoto to learn textile dyeing techniques. 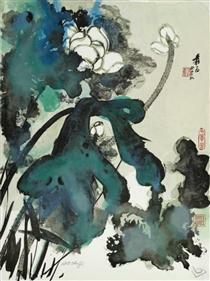 He later returned to Shanghai and established a successful career selling his paintings. The governor of Qinghai, Ma Bufang, sent Chang to Sku'bum to seek helpers for analyzing and copying Dunhuang's Buddhist art. Due to the political climate of China in 1949, he left the country and resided in Mendoza, Argentina, São Paulo and Mogi das Cruzes, Brazil, and then to Carmel, California, before settling in Taipei, Taiwan in 1978. During his years of wandering he had several wives simultaneously, curried favor with influential people, and maintained a large entourage of relatives and supporters. He also kept a pet gibbon. He affected the long robe and long beard of a scholar. A meeting between Chang and Picasso in Nice, France in 1956 was viewed as a summit between the preeminent masters of Eastern and Western art. The two men exchanged paintings at this meeting. 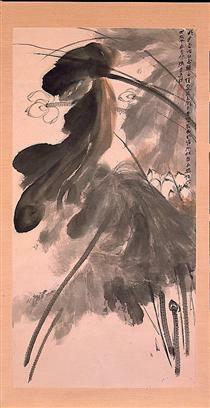 Zhang's early professional painting was primarily in Shanghai. 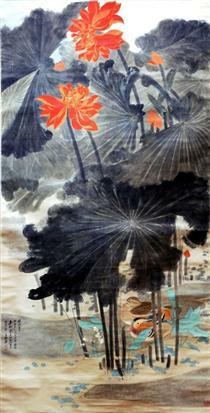 In the late 1920s he moved to Beijing where he collaborated with Pu Xinyu. 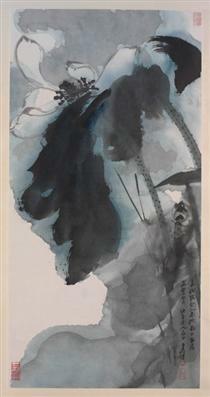 In the 1930s he worked out of a studio on the grounds of the Master of the Nets Garden in Suzhou. 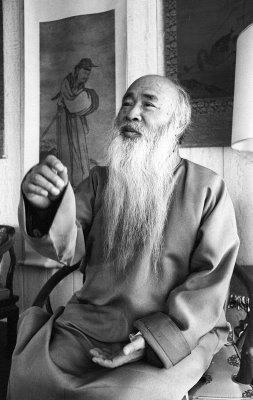 In 1940 he led a group of artists in copying the Buddhist wall paintings in the Mogao and Yulin caves. 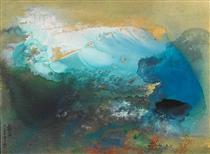 In the late 1950s, his deteriorating eyesight led him to develop his splashed color, or pocai, style. In the 1970s, he mentored painter Minol Araki. Second, he paid scrupulous attention to the materials he used. "He studied paper, ink, brushes, pigments, seals, seal paste, and scroll mountings in exacting detail. When he wrote an inscription on a painting, he sometimes included a postscript describing the type of paper, the age and the origin of the ink, or the provenance of the pigments he had used." Third, he often forged paintings based on descriptions in catalogues of lost paintings; his forgeries came with ready-made provenance. 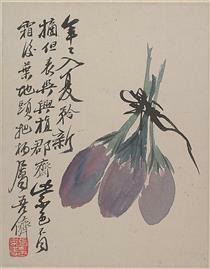 unknown title Chang Dai-chien ? 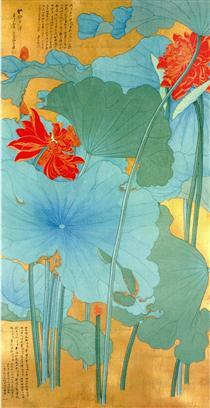 Crimson lotuses on gold screen Chang Dai-chien ?